I went to the flea market on Saturday and searched the produce stalls for something pretty to paint. I thought it would be nice if it could also be something I would enjoy eating, but appearance took precedence over yumminess in this particular quest. 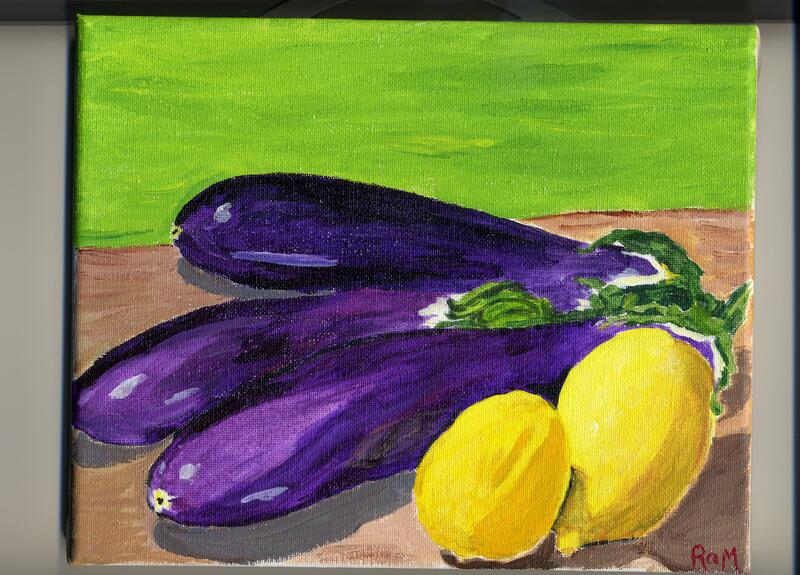 The most attractive things I found were long, thin Japanese eggplants. I bought the three prettiest ones I saw, and I hurried home to paint them. I did a study first, on paper. That is the weirdest thing. I never thought I would do studies; I thought studies would be tedious, but now I’m doing studies. I want to do studies. I want to work on issues and solve problems. Next thing you know, I’ll be doing thumbnail sketches and color notes. I can see it coming. 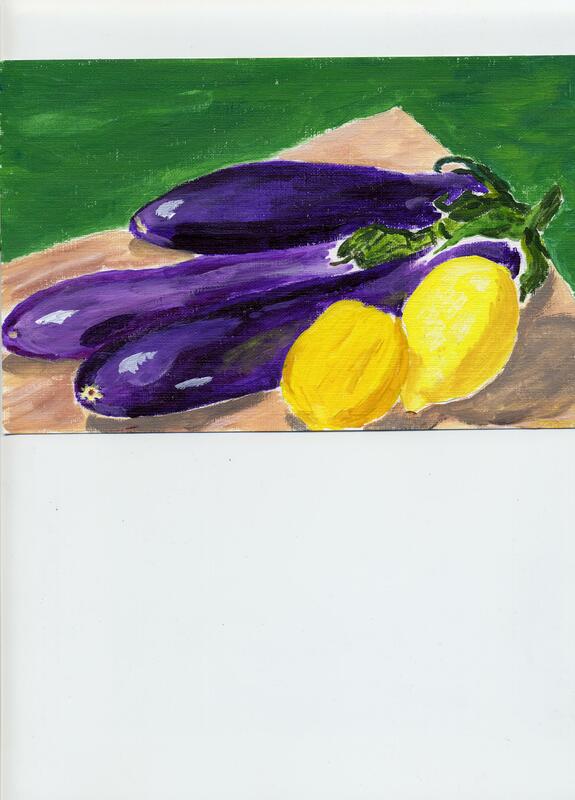 I’m already adding complementary colors – note the green background behind the purple eggplants and the yellow lemons in front of them. Not that I thought to myself, “This composition needs some complementary colors.” No, I just put things together until I liked the way everything looked and there they were – complementary colors. This is getting interesting, so it’s a shame it’s almost April. April and May are the two busiest months of the year for the tie-dye business, because our biggest festival is Memorial Day Weekend. We work long hours in April and May. We often work right through the weekends if the sun is shining. Last year, I started this blog in February and posted absolutely nothing in April or May. Or June, for that matter — I was still recovering from April and May. That was before I committed to posting at least once a week. That was why I committed to posting at least once a week. I intend to honor that commitment. Oh, and I’ve also sort of told my daughter that I will participate in Camp NaNoWriMo this April. Yes, I am out of my mind. This has become an important question, because I actually like this painting and that makes two in a row. This entry was posted in Uncategorized and tagged Camp NaNoWriMo, creativity, painting, tie-dye, time on March 27, 2014 by releaf1954. “Outlook not so good,” said the Magic 8-Ball. I knew the Magic 8-Ball was hardly infallible, but it was still discouraging. My daughter said it just meant that I was hypercritical of my own work. According to her, I was painting nice things but I was my own worst critic. The Magic 8-Ball wasn’t saying that I would never paint a good painting; it was saying that I was impossible to please. Either way, it did not bode well for my happiness. I tried not to take it to heart. The Magic 8-Ball is just a toy, after all, not a sacred oracle. There was only one painting required by my first year blog goals, anyway. I could do that painting and celebrate its completion, whether or not I was actually pleased with the result. I didn’t know then that my heart would turn toward painting in my second blog year. The pull was strong and would not be ignored. It was what I had been hoping and praying for that whole first year – that one of the creative things I tried in that year would open my closed heart and shine a light into my soul. My soul had been feeling tired and dark and cold for a lot of years. I was hoping to get a little fire going, somehow. Honestly, I did not have high hopes. It was a surprise to me that it worked. It was even more of a surprise that the one thing I most wanted to do at the end of it was paint. I remembered the Magic 8-Ball but I still wanted to paint. I’ve been doing it now for six weeks and most of my attempts have been disappointing, but I have not wanted to give up. I have just wanted to keep trying. 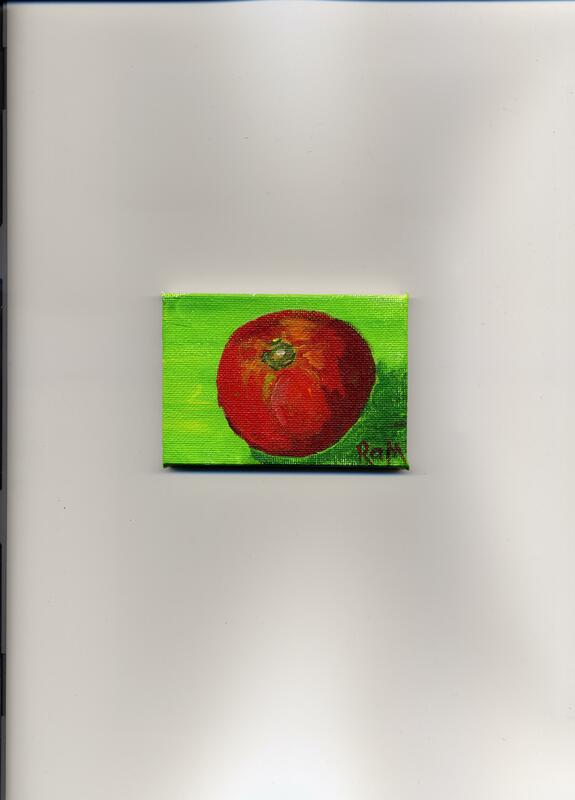 I painted a tiny painting this week, just to make sure there would be something to blog about. Cute, isn’t it? Once it was done, I took another look at the fruit and flowers I bought earlier and decided to rearrange them and paint them again. I cut down one of the sunflower stems and put the sunflower in a small jar. I put the jar behind the plate of pears and put them all against a blue background. What surprised me about this painting was that I liked the way the plate turned out. 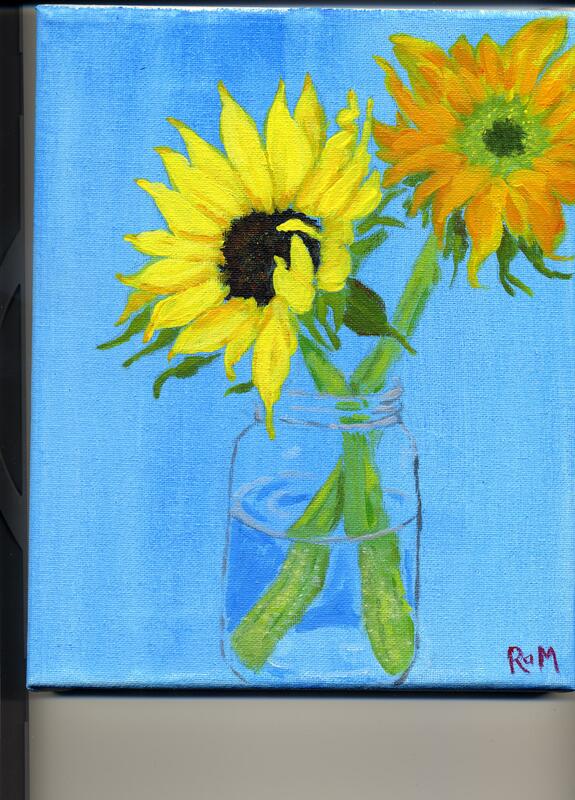 The next day, I saw that two of the sunflowers had wilted, but two of them were still in pretty good shape. I took the two good ones and cut the stems a bit shorter and put them in the jar. 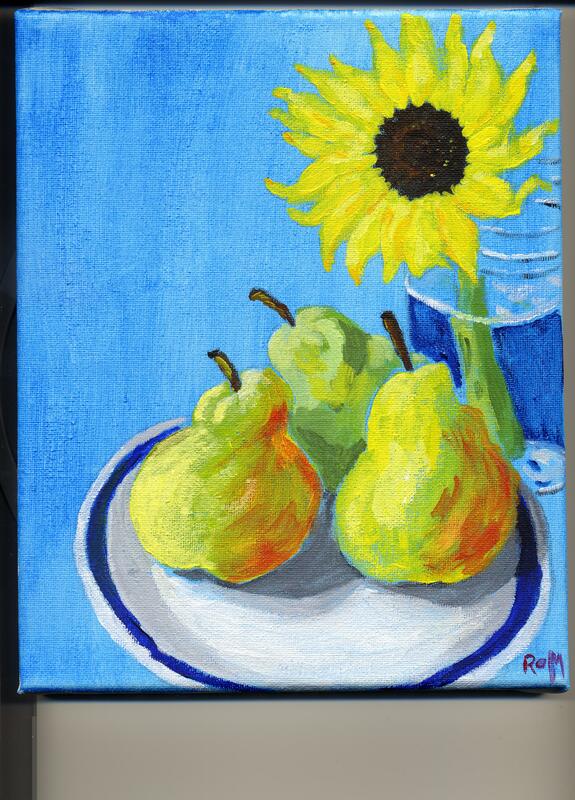 I set the pears aside and just painted the sunflowers. It was when I finished this one that I knew the Magic 8-Ball was wrong. I like this painting. This entry was posted in Uncategorized and tagged creativity, inner critic, Magic 8-Ball, painting on March 21, 2014 by releaf1954. Friday was not blog day this past week, but it was a day of working on getting things done, so I would have something to write about when I was ready to blog. I’m friends with a Vincent Van Gogh page on facebook and I’d recently seen a couple of his paintings of lemons. 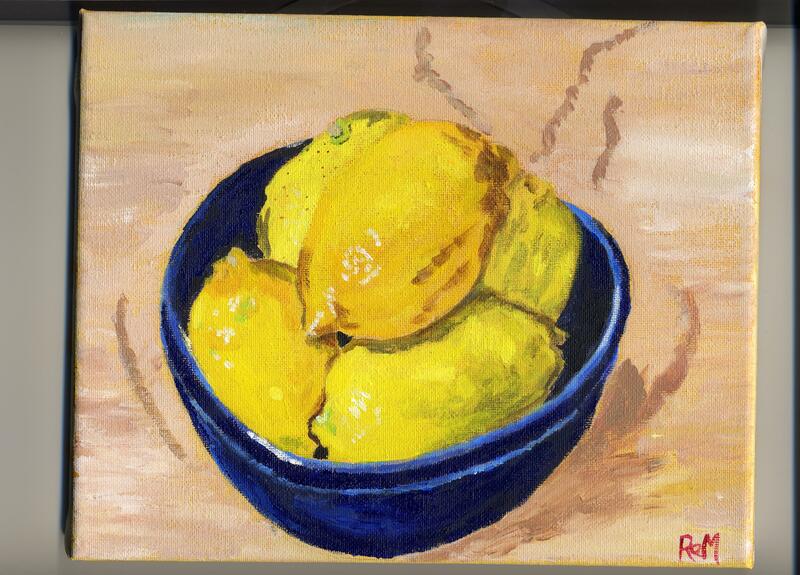 I thought I might try painting some lemons. If they’re good enough for Vincent, they’re good enough for me, right? I decided to go to the grocery store and get some lemons. I also needed gas and cash, though, so I went to the gas station and the ATM before heading to Publix. Since my memory is not what it once was, I was running my little three-item list through my head as I went to the car. “Gas, cash and lemons,” I thought, over and over again, so I would remember what I needed to get. Yes, I could have written a list, but it was three items. I should be able to remember three items. “Gas, cash and lemons,” I thought, as I drove to the gas station. “Gas, cash and lemons,” I thought, as I drove to the ATM. “Gas, cash and lemons,” I thought, as I drove to the grocery store. People probably stared at me as I stood there, laughing at nothing in the parking lot at Publix. Then I walked inside, needing only lemons, since gas and cash had already been acquired. The first thing that caught my eye, though, was a lovely display of pears. They looked delicious. Also paintable. I picked up some pears. Then I passed the flower display on my way to the lemons and I couldn’t help but notice that there was a bouquet of sunflowers with two different kinds of sunflowers in it. 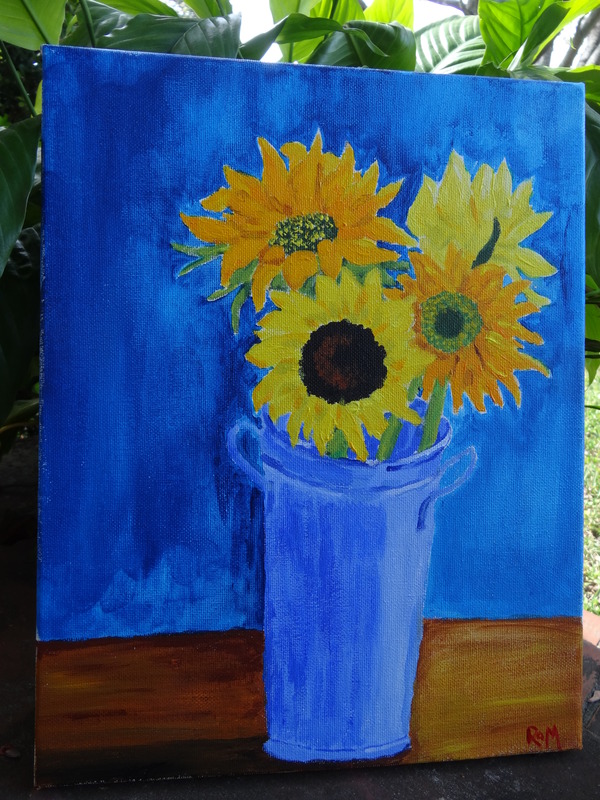 I love sunflowers and I was already running on Van Gogh inspiration, so I bought sunflowers. I drove home with three different things I could try to paint. No lemmings, though. They were fresh out of lemmings. That’s okay, I’m pretty sure I’m better with flora than fauna, anyway. Nice little fruits and flowers that will stay where I put them are challenging enough for me right now. I was feeling excited about trying to paint, but I had one more errand to run. An ad in last Sunday’s paper had told me that a local craft store was having a huge sale on multi-packs of prepared canvases. I’ve committed to finishing fifty paintings this year, so I didn’t want to miss that sale. By the time I returned from the far-flung craft store, I had a ten-pack of 8”x10” canvases, a seven-pack of 11”x14” canvases and a five-pack of 16”x20” canvases. And no more excuses. I started with the lemons. I put all five of them in a blue bowl and looked for a cloth to use as a background. I got in a hurry and chose the first thing I could find. An unbleached muslin dish towel does not make a pretty background. Another lesson learned. Okay, I’m not fond of the background, but I don’t hate the whole painting. I’ve started trying to look for things I like about each painting, instead of things I hate. I like the shapes of the lemons and I like the color of the bowl. I can see all the imperfections, but there’s at least one highlight on that bowl that makes me happy. Progress! That was enough for one day, but I woke up on Saturday with a feeling of pleasant anticipation. It’s been a long time since I’ve felt that way, first thing in the morning. I was actually looking forward to painting again. I put three of the pears on a white plate. I gave more thought to the background for this one, but I still made an unfortunate choice. 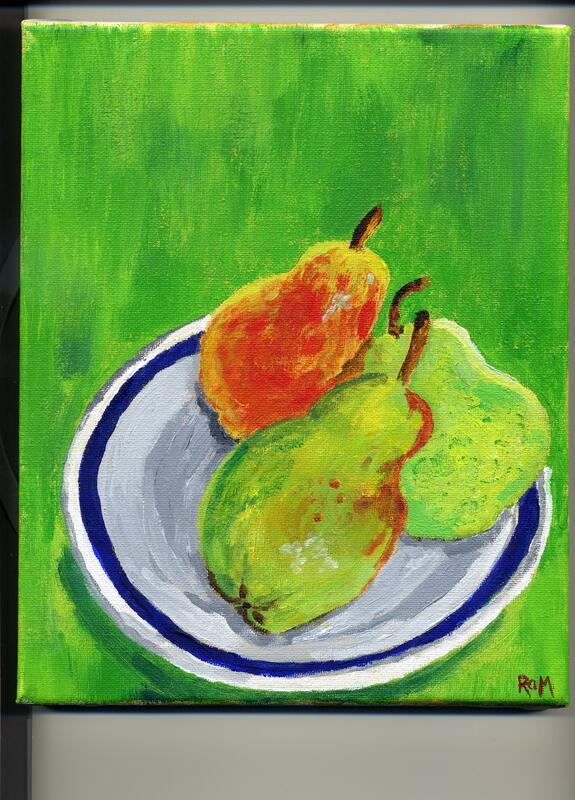 In the real world, the green of the background is a very different green than that of the pears, but it doesn’t look that way in the painting. Oh, well…there is still something I like about this painting. I like the stems on the pears. Today is Sunday and today I was way too ambitious. I tried to capture the sunflowers. I don’t hate this painting, either, but it’s pretty far from what I was imagining, and from what I saw in front of me. The blue of the container is a very different blue from the background color, but it looks the same in the photograph. It appears I am now going to have to learn something about photography, if I want you to see my paintings as I see them. Still, I’m happy today. I painted and it was fun. I’m looking forward to painting again, and I am not going to run out of canvases. Life is good. This entry was posted in Uncategorized and tagged blogging, creativity, painting on March 16, 2014 by releaf1954. So I said I was going to blog at least once a week, but it did not occur to me to specify exactly what I meant by that. Did I mean a calendar week? If I did, I can satisfy my commitment by blogging any time this week, but if I meant that I would not let a whole week go by without blogging, I need to blog today. If I blog today, will that mean Wednesday is now blog day? I may not want Wednesday to be blog day. Friday was working pretty well for me. Who knows what will happen if I switch to Wednesday? I don’t think I’m ready to allow myself flexibility just yet. I need to be sure this is an established habit before I start fiddling with the rules. In this blog’s first year, I let three months go by with no entries at all. Three months! The blog was young then and I had not decided how often I wanted to post. Once I saw how easy it was to lose track of that much time, I knew I needed to make a commitment. I went ahead and said I would post at least once a week, and I haven’t missed a week since. The commitment matters. Maybe I should remember that when I’m trying to find time to be creative in other ways. I’ll have to think about that, but I’m not ready to add any new commitments to my schedule right now. I’m already up past my bedtime trying to keep the one I made about the blog, and I just realized that I have not received a reminder from WordPress in my e-mail yet and that means that WordPress is pretty sure I meant once per calendar week, not once every seven days. WordPress is nicer than my obsessive inner critic. This entry was posted in Uncategorized and tagged blogging, commitment, creativity, inner critic on March 12, 2014 by releaf1954. I’ve become rather obsessive about posting something on this blog once a week. This week, I won’t be able to manage my usual Friday post. I will be camping at a folk festival and I will not be bringing a computer with me. I will be on my feet for three days straight in the tie-dye booth and sleeping in a tent at night. It’s not an ideal blogging situation, but it will be fun. The tent will be right behind the tie-dye booth, which will be very near the main stage. Music goes on for hours after the official show ends for the night. It just moves from the stages to the campfire circles. I love falling asleep to the sound of fiddles. I’m happy that we did manage to get caught up on our little girls’ dresses. I pre-soaked a lot of things when we started trying to gear up for this festival and not all of them made it all the way through the tie-dye process. We work outdoors, so our work is weather-dependent. We had some gorgeous days these past two weeks, but we also had some impossible days. Maybe some people work outside with wet things when temperatures are in the thirties; I am not willing to do that. 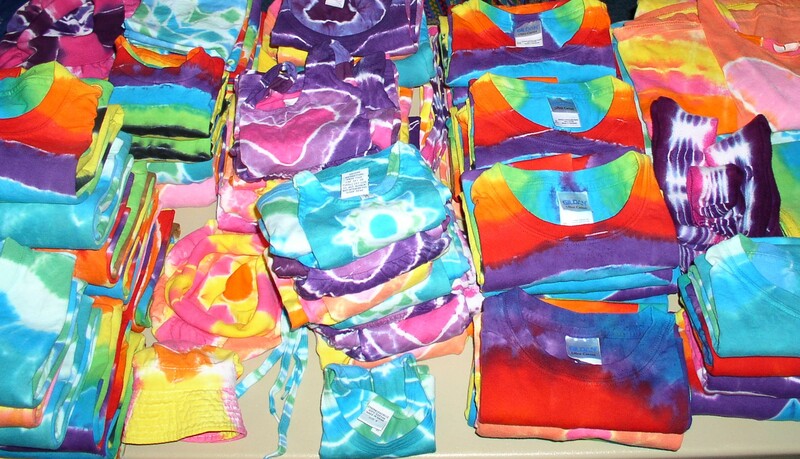 We have plenty of tie-dye – way more than we will sell at this festival. The problem, of course, is choice. A person may only buy one thing, but that person wants a lot of things from which to choose. When we do our biggest festival of the year, we rent a truck, so we can bring everything we can fit into a 10′ x 20′ booth. We do that because we know the sales at that event will be enough to justify the expense. This weekend’s festival is quite a bit smaller. We will have a 10′ x 10′ space and we have to fit everything we’re bringing (including all our camping gear) in my husband’s Honda Odyssey. That job belongs to my daughter. She is my partner in the tie-dye business and I couldn’t do it without her. That’s partly because she does all the tying (I do the dyeing), but it’s also because she figures out how to fit everything into the van. I can fetch and carry things, but I do not decide where they go in the van. That’s her special gift. If I tried to do it myself, I would be weeping and tearing my hair out long before I could get half of the tie-dye into the vehicle. Thank goodness I don’t have to try. I just get to drive the van, which is not my every-day vehicle, for several hours tomorrow in, if the Weather Channel is to be believed, steady rain and possible thunderstorms. On the upside, Saturday and Sunday are supposed to be sunny. Whatever gets wet on Thursday should have time to dry out before we have to pack it back up at the end of the weekend. With any luck, there will be less of it to pack up at that point. I did not manage to paint anything this week, but I did produce some colorful things. This entry was posted in Uncategorized and tagged festivals, tie-dye, travel on March 5, 2014 by releaf1954.